button on the steering wheel, you can choose from the commands on the Main Menu. The following pages describe these commands and the commands in each sub-menu. Remember to wait for the tone before speaking. After the main menu, you can say “Help” to hear the list of commands currently available any time the system is waiting for a response. If you want to end an action without completing it, you can say “Cancel” or “Quit” at any time the system is waiting for a response. The system will end the VR session. Whenever the VR session is cancelled, a double beep is played to indicate you have exited the system. If you have stored entries in the phonebook, you can dial a number associated with a name. See “Phonebook” in this section to learn how to store entries. When prompted by the system, say the name of the phone book entry you wish to call. The system acknowledges the name. If there are multiple numbers associated with the name, the system asks you to choose the correct number. Once you have confirmed the name and location, the system begins the call. When prompted by the system, say the number you wish to call. 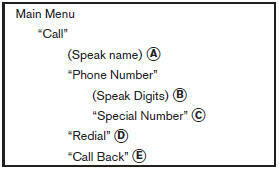 Refer to “How to say numbers” and “Making a call by entering a phone number” in this section for more details. For dialing more than 10 digits or any special characters, say “Special Number”. When the system acknowledges the command, the system will prompt you to speak the number. Use the Redial command to call the last number that was dialed. The system acknowledges the command, repeats the number and begins dialing. If a redial number does not exist, the system announces, “There is no number to redial” and ends the VR session. Use the Call Back command to dial the number of the last incoming call within the vehicle. If a call back number does not exist, the system announces, “There is no number to call back” and ends the VR session. steering wheel to mute the receiving voice and enter commands. ● “Help” — The system announces the available commands. ● “Go back/Correction” — The system announces “Go back,” ends the VR session and returns to the call. ● “Cancel/Quit” — The system announces “Cancel,” ends the VR session and returns to the call. ● “Send/Enter/Call/Dial” — Use the Send command to enter numbers, “*” or “#” during a call. For example, if you were directed to dial an extension by an automated system: Say: “Send one two three four.” The system acknowledges the command and sends the tones associated with the numbers. The system then ends the VR session and returns to the call. Say “star” for “*”, Say “pound” for “#”. ● “Transfer call”— Use the Transfer Call command to transfer the call from the Bluetooth® Hands-Free Phone System to the cellular phone when privacy is desired. The system announces, “Transfer call. Call transferred to privacy mode.” The system then ends the VR session. To reconnect the call from the cellular phone to the Bluetooth® Hands-Free System, press the button. ● “Mute” — Use the Mute command to mute your voice so the other party cannot hear it. Use the mute command again to unmute your voice. If a call is ended or the cellular phone network connection is lost while the Mute feature is on, the Mute feature will be reset to “off” for the next call so the other party can hear your voice. The “Transfer Entry” command is not available when the vehicle is moving. 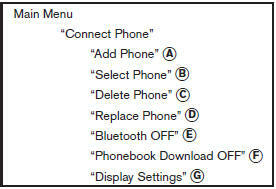 For phones that do not support automatic download of the phonebook (PBAP Bluetooth® profile), the “Phonebook”command is used to manually add entries to the vehicle phonebook. The phonebook stores up to 40 names for each phone connected to the system. Use the Transfer Entry command to store a new name in the system. When prompted by the system, say the name you would like to give the new entry. For example, say: “Mary.” If the name is too long or too short, the system tells you, then prompts you for a name again. Also, if the name sounds too much like a name already stored, the system tells you, then prompts you for a name again. The system will ask you to transfer a phone number stored in the cellular phone’s memory. Enter a phone number by voice command: For example, say: “five five five one two one two.” See “How to say numbers” in this section for more information. To transfer a phone number stored in the cellular phone’s memory: Say “Transfer entry.” The system acknowledges the command and asks you to initiate the transfer from the phone handset. The new contact phone number will be transferred from the cellular phone via the Bluetooth® communication link. The transfer procedure varies according to each cellular phone. See the cellular phone Owner’s Manual for details. You can also visit www.nissanusa.com/bluetooth for instructions on transferring phone numbers from NISSAN recommended cellular phones. The system repeats the number and prompts you for the next command. When you have finished entering numbers or transferring an entry, choose “Store.” The system confirms the name, location and number. Use the Delete Entry command to erase one entry from the phonebook. After the system recognizes the command, speak the name to delete or say “List Names” to choose an entry. Use the List Names command to hear all the names in the phonebook. The system recites the phonebook entries but does not include the actual phone numbers. steering wheel. The system ends the VR session. For phones that support automatic download of the phonebook (PBAP Bluetooth® profile), the “Phonebook” command is used to manage entries in the vehicle phonebook. You can say the name of an entry at this menu to initiate dialing of that entry. The phonebook stores up to 1000 names for each phone connected to the system. steering wheel. The system ends the VR session. See the “Record name”command in this section for information about recording custom voice tags for list entries that the system has difficulty pronouncing. The system allows you to record custom voice tags for contact names in the phonebook that the vehicle has difficulty recognizing. This feature can also be used to record voice tags to directly dial an entry with multiple numbers. Up to 40 voice tags can be recorded to the system. Use the Recent Calls command to access outgoing, incoming, missed calls and to call back the last incoming call or to redial the last outgoing call. Use the Incoming command to list the incoming calls made to the vehicle. Use the Missed command to list the calls made to the vehicle that were not answered. Use the Call Back command to dial the number of the last incoming call to the vehicle. Use the Redial command to dial the number of the last outgoing call from the vehicle. The Add Phone command is not available when the vehicle is moving. Use the Connect Phone commands to manage the phones connecting to the vehicle or to enable the Bluetooth® function on the vehicle. Use the Add Phone command to add a phone to the vehicle. See “Connecting procedure” in this section for more information. Use the Select Phone command to select from a list of phones connected to the vehicle. The system will list the names assigned to each phone and then prompt you for the phone you wish to select. Only one phone can be active at a time. Use the Delete Phone command to delete a phone that is connected to the vehicle. The system will list the names assigned to each phone and then prompt you for the phone you wish to delete. Deleting a phone from the vehicle will also delete that phonebook for that phone. Use the Replace Phone command to replace an existing phone pairing with a new phone. The system will keep all voice tags assigned to your phonebook. Use the Bluetooth OFF command to prevent a wireless connection to your phone. Use the Phonebook Download OFF command to turn off the automatic downloading of the handset phonebook to the available (if supported by the cellular phone). When the command is recognized, “Sync Contacts OFF” will appear on the audio display. To turn the feature back on, say “Phonebook Download”. When the command is recognized, “Sync Contacts ON” will appear on the audio display. Use the Display Settings command to control where incoming call notifications are displayed in the vehicle. Say “Driver Only” to have call notifications shown on the vehicle information display only. Say “Both” to have call notifications shown on both the vehicle information display and the center audio display.